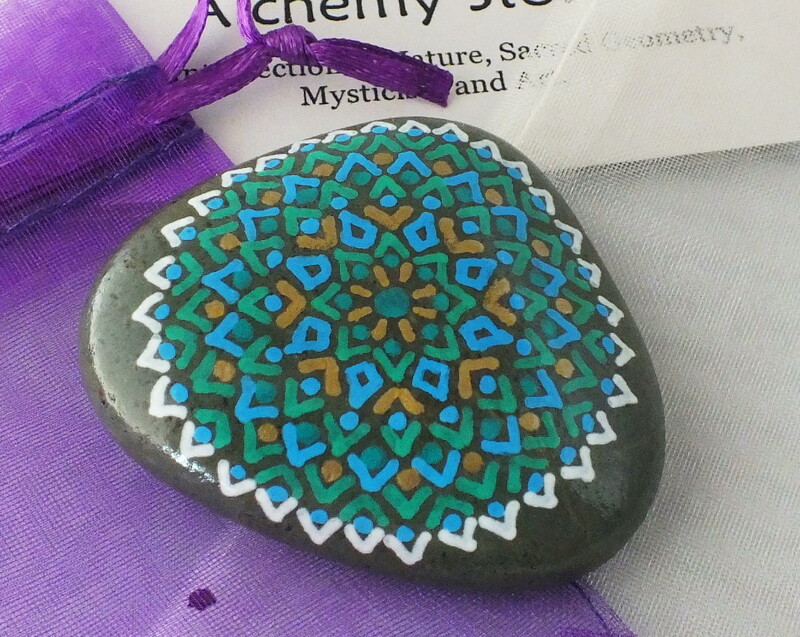 An extensive selection of different Alchemy Stones are currently available through the Alchemy Stones web shops on Etsy and eBay. 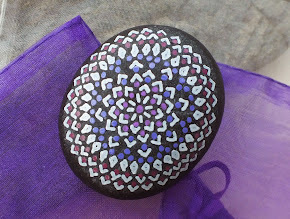 The number will always be "limited" because I only paint on stones when the inspiration moves me, and Sarah only makes the Treasure Bags for the special stones when the inspiration moves her. At the moment (early December 2014) we have a particularly nice selection available because we've been preparing for for holiday arts & crafts fairs, and just for the holidays in general. We appreciate your interest! As a general rule, Alchemy Stones run from about $7.50 for a small stone with a fairly basic design to over $100.00 for a large elaborately patterned stone with a special Treasure Bag. We are also adding an increasing number of sets, created around a variety of metaphysical purposes. In summary, every stone is hand painted by Peter and has a protective clear coat to ensure the design will last for a very long time. Some stones come with their own custom made "Treasure Bag," created by Sarah, and they make an especially beautiful gift for a loved one. Our smaller and simpler designs come in our standard organza gift bags. All stones have the Alchemy Stone insignia on the back, and are individually numbered. A small pamphlet outlining the story, background and history of Alchemy Stones is included with each stone, and "Treasure Bag Stones" additionally come with a certificate of authenticity. We keep no set schedule for adding new items for sale, as it tends to depend on when we are feeling creative, and when we decide a particular stone we have been working on is both "finished" and "good enough" to share with the world. Since no two stones will ever be the same, we encourage you to acquire a stone that really appeals to you when you see it. To maintain uniqueness, we do not accept requests for stones to be made that look "just like" a previous design, sorry. We will consider requests for "can you make eight stones approximately the same," for special occasions like Bridesmaids' gifts, wedding parties or workshops. However, please keep in mind that such requests must fit within the general variation of natural stones (no two are every truly the same) and hand made designs, which can be similar, but are never identical.